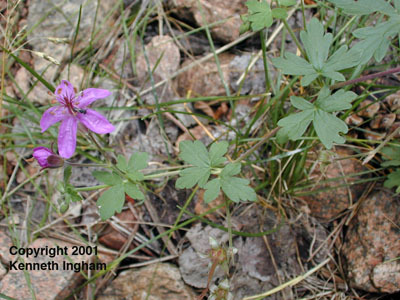 Overview of Geranium caespitosum taken along the Black Canyon Trail in the Santa Fe National Forest, 3 August 2001. This wild relative of the common geranium found around homes, has a gorgeous purple/magenta bloom. The leaves are distinctive and easy to identify for the genus.